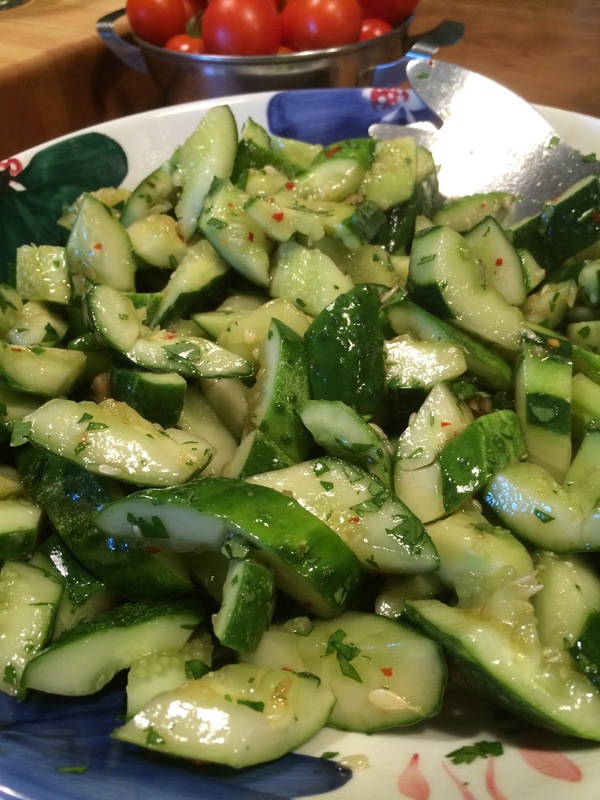 The cucumbers just keep coming…and I don’t mind a bit. Try them with a bit of spice in this recipe I adapted from Superiority Burger in NYC, and the smashing technique lends itself to lots of other dishes as well. Slice an English, Persian or small pickling cucumber in half the long way then cut into four inch lengths. Place a segment seed side down on your cutting board, cover with the side of a large knife, and using your other hand gently smash so the skin splits and the seeds separate. Repeat on the remaining segments then slice into bite size pieces removing as many of the seeds as possible. For the dressing dissolve two teaspoons of sugar and one of salt in a couple of tablespoons of rice wine vinegar. Then stir in two teaspoons each of sesame oil and soy sauce, a tablespoon of oil, two minced garlic cloves, and red chili flakes to taste. Toss together with the cucumbers and garnish with cilantro and or sesame seeds.